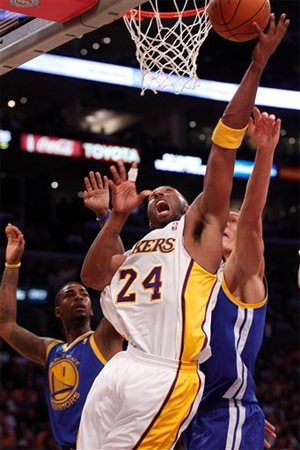 Kobe Bryant scores two of his 20 points against Warriors. It’s not even November yet, so it’s hard to make much of a 3-0 record, but the Lakers have started the season playing solid basketball, as they pounded the Golden St. Warriors 107-83 at Staples Center on Sunday night. The game, played on Halloween night, must have felt like a nightmare for the Warriors who continue to struggle against the Lakers, losing 10 straight regular season contests. The world champs dominated inside all night as they outrebounded the Warriors 55-42, and held the boys from the Bay Area to under 41% shooting from the field. The Lakers led 34-14 after one quarter, and the Warriors never recovered, trailing by as much as 32 in the fourth. Pau Gasol continued his strong start to the season with another double-double, leading everyone with 26 and 12 rebounds in under 35 minutes. Kobe Bryant, who told reporters after the game that his knee was 100%, scored 20 points and grabbed seven boards, and got most of the night off in the blowout. He played just 27 minutes. Lamar Odom had another big game with 16 points and 14 rebounds, and Derek Fisher had a season-high 14 points. Golden St.’s big offseason acquisition David Lee, was held scoreless in 19 minutes and grabbed just three rebounds, as the Lakers made it a point to keep him off the glass. Monta Ellis led the visitors with 20 points, but struggled to find his rhythm as he was swarmed on defense all night. Dorell Wright had a solid game with 18 points and five rebounds. The Warriors played without guard Stephen Curry who is nursing a sore ankle. The only real negative to the evening were the 20 turnovers the Lakers committed, which Phil Jackson saw as an area of concern that will need to be addressed. The Lakers even found minutes for their two rookies, with both Devin Ebanks and Derrick Caracter scoring the first four points of their NBA careers during “garbage time” in the fourth quarter. The Lakers’ next game will be Tuesday night at home against the Memphis Grizzlies, who have been without forward Zach Randolph since he took a hard fall and injured his back on opening night. Karl Malone and Gary Payton are now officially members of the Los Angeles Lakers, after signing contracts shortly after midnight Eastern time on Wednesday. Malone signed a 2-year deal worth $3 million, while Payton also signed a multi-year contract, which will pay him $4.9 million this season. Laker team spokesman John Black and general manager Mitch Kupchak had dinner at a West Los Angeles restaurant Tuesday night with Payton and his agent, Aaron Goodwin, and Malone’s agent, Dwight Manley. Lakers front office employees Ronnie Lester and Bill Bertka were also present. Malone faxed in his contract from Arkansas shortly after it was allowed to be signed. The players will be formally introduced Thursday at Staples Center. The addition of Malone and Payton to the already potent tandem of Shaquille O’Neal and Kobe Bryant, will give the Lakers one of the more feared starting lineups in NBA history.